If you know you are always going to be using the same printer (and you have more than one printer installed on your computer, such as a local printer and one or more network printers), you can make that printer the default printer that will be used each time you print from Windows programs. 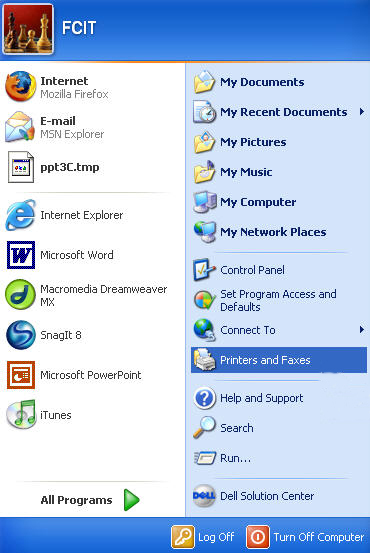 Choose Printer and Faxes in the Control Panel (Start, Control Panel, Printers and Faxes). Right-click on the printer you want to make the default printer. 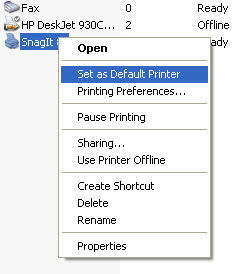 From the context menu that opens up select Set as Default Printer. Once you complete these steps the printer will be used any time you click on the printer button in the toolbar of your Windows program. If you decide to use the dialog box by choosing File, Print the default printer will already be listed in the dropdown menu so that you can just click on OK to print.